South Dublin County Council is currently undertaking a review of the Adamstown Strategic Development Zone (SDZ) Planning Scheme. A non-statutory pre-plan public consultation took place in March/April 2013 to inform residents and other stakeholders of the review process. The public were invited to make submissions in total 37 submissions received. From the information contained in the submissions, the Managers report has summarise issues raised by all in their submissions. A number of residents made personal submissions as well as submissions from residents associations and local schools. There were also submissions from The Rail Procurement Agency, Irish Rail, The Environmental Protection agency and Lucan Planning Council. In case some people reading this are unaware there are 3 developers which make up Chartridge ltd which is developing Adamstown all have made a submission either directly or through an agent, (it should be pointed out that Maplewood are in receivership). All took the opportunity to set out their stall for the future development of Adamstown. The delay in the delivery of the secondary school sports hall. Revise the type of materials, finishes and landscaping (which presumable means “use cheaper products and finishes”). The first phase of Adamstown District Centre should be pushed back a phase. Request investigation as to whether Fire Station in Somerton remains a current or future requirement and examine flexibility on location in conjunction with landowner. (In other words we don’t care about the future needs of Adamstown/Lucan that will hit 70,000 in the next 10 years; we would like that land back to build houses on). Interesting to see Councillor William Lavelle, (FG) himself a former architect putting down some point in his own submission suggesting that the densities need to be lowered. The main reason the developers want to go back to 3 bed urban sprawl is it reduce the density of Adamstown and in turn diminish the need for the same level of social infrastructure that is in the existing Adamstown SDZ. Yes there is a need to remove one bedroom units from any further plans and increase the size of 2 and 3 bedroom units. Going back to 3 bedroom homes on top of reducing densities will also see the return of gated private green areas which will mean less public green space where so much social interaction between children takes place in Adamstown in a safe environment. The real losers here will be those existing homeowners who already paid a premium price for the promise of a complete town. The developer/bankers now want those same people to take another hit by tearing up their contract with homeowners to provide a fully sustainable town, with community centres, parks, leisure centre, swimming pool, viable public transport and a town centre that would create employment for its future residents. Adamstown is not a housing estate the SDZ envisaged was a new concept for building new towns all over Ireland. When completed Adamstown will have a population even with reduced densities in excess of 20,000 people. That’s as large as county towns such as Navan and Nass, attached to Lucan where the population is currently just under 50,000. In 10 years’ time it’s more than likely that Adamstown/Lucan’s population will hit 80,000, more than the current population of Galway city the 5th largest city in Ireland. We cannot return to planning in isolation this is a large town that being developed not a little estate. If the authorities remove any of the social infrastructures currently proposed the knock on effects it that Adamstown/Lucan will beset by social issues that will take generations to correct, dare I mention creating a “Ghost Town”. Why are we putting builder’s profits before proper planning? The original plan was a good one let’s stick to the programme and build a community not houses. If you have not seen the full report and want to receive a copy please send me a message or email me. If you are still reading you might want to review my own submission to South Dublin planning Department. Please see my observations below for the review of the Adamstown SDZ Planning Scheme, (2003) and South Dublin County Councils proposal to amend the Planning Scheme. I attended both Pre- Plan public consultation and workshops in Finnstown House Hotel. Lucan had being blighted for the previous 15 year with a Hodge–podge of housing schemes of 300 – 400 homes planned and developed in isolation with no delivery of amenities. This created an urban sprawl where public transport did not exist leading to gridlock of the entire area morning and evening. The Adamstown scheme approved by SDCC had no binding commitments or timelines by the developers or the relevant agencies to deliver social infrastructure, amenities or public transport in tandem with the development. The majority of our concerns were included in the final plan adopted by An Bord Pleanála following an 8 day Oral Hearing. It tied the delivery of social infrastructure, schools and other amenities in tandem with the building of housing units, a first in the State. Mistakes of previous planning authorities in planning large towns are still with us to this day, in towns such as Tallaght and in Ballymun which has been completely dismantled because it had become an area of great social unrest due to lack of facilities and amenities. Moving on to the current decision to review of the Adamstown SDZ Planning Scheme, 10 years on since it was first approved. To say the scheme is 10 years old and needs to reviewed, presents a case which is not entirely true. Development did not take place in Adamstown until late 2004 with the first homes occupied in early 2006, the scheme stalled in 2009. Delivering the majority of what is now Adamstown occurred over an impressive 3 year timeframe not 10. In 2009, the Adamstown Strategic Development Zone (SDZ) received a Royal Town Planning Institute (RTPI) Planning Award for Sustainable Communities. 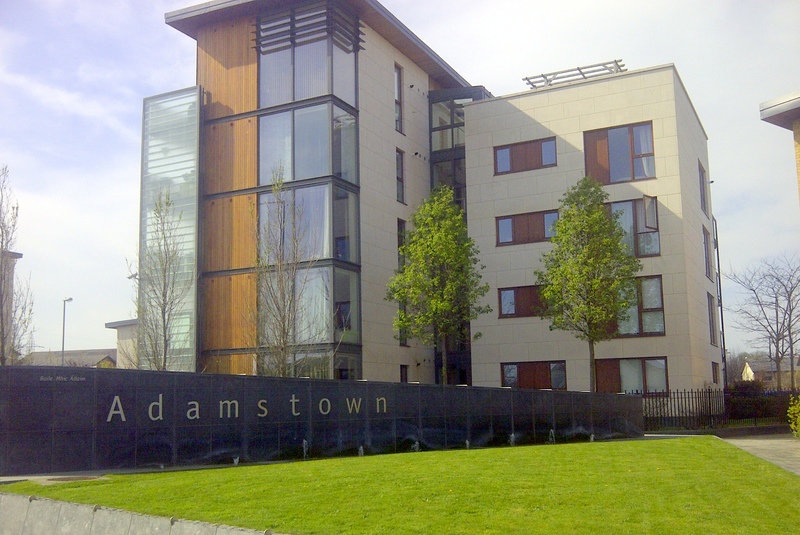 The (RTPI) Judges stated the reason for making the award to Adamstown, “we were impressed by the quality and scale of the development at Adamstown. It is of a size (10,000 homes plus community and employment uses) often advocated for ‘new settlements’ and, as such, is a model for developments elsewhere”. At that time Frank Nevin, The Director of Planning at South Dublin County Council had this to say about Adamstown winning the award “this international award represents recognition of how sustainable communities can be achieved through the SDZ process which is on-going in Adamstown and will be replicated in the Clonburris area”. Driven up the price of lands, in the catchment area for greater Dublin. It created speculation of what lands may needed to be rezoned and hoarding of land banks. Forced future of generations of Dubliners to move further away from their families and places of work. Created a car driven society. Families living in estates where there are no amenities or services, or schools or public exists. The blueprint for the Adamstown scheme is still a good one, the only reason that the scheme has stalled is due to the collapse of the housing market in Ireland and a total meltdown of the Irish banking sector. Adopting a plan that guaranteed the delivery of infrastructure with housing has worked, with approximately 1,200 units completed, Adamstown has 2 primary schools, a secondary schools (well-designed permanent buildings) a large crèche, Train Station, children’s playground, bus service, and district centre and mature landscaping. The design and layout of all units is of a very high standard and the units are larger in size, good insulation and more daylight that most other apartment schemes. I have not met any of my neighbours who are unhappy with the design of the housing units. Most neighbours spoke at the meetings of how Adamstown had a “European Feel”, it is friendly and multi cultured. Most home owners are now in negative equity (60%) and feel hard done by its own Government, developers and bankers. Irresponsible PR and marketing of the Adamstown proved a total disaster: placing billboards advertising the opening of the Sports complex and swimming pool coming in 2009 was reckless, when it was clearly linked through phasing (phase 3 the delivery of 2,600 units) currently Adamstown has 1,200 units. With the exception of the current negative value of their homes more people are more upset by that false advertising which was done. Management fees are a huge issue in every housing development with shared services. Home owners are getting a very poor service for the annual fees the pay. With 2/3 developments companies forming the consortium, Chartdrige developments, there is a huge contrast between the aesthetically pleasing feel of (Castlethorn’s), Castlegate area, that of (Maplewood’s) The Paddock which has being left in a very unsatisfactory state. Not joining up both Castlegate and The Paddocks has left the Paddocks feeling like the poor relation with all the infrastructure located in the Castlegate area. The unfinished sentinel building (Castlegate) has encouraged some unsociable behaviour from teenagers, and the shops have being subject to a number of break-ins, directly related to the unfinished and isolation of this area. Nobody likes seeing the developments stalled, but any revival must not be at the expense of infrastructural commitments made under the original plan. If this were to happen resident now 60% down on their original investment will be losing even more. The Adamstown Community College is still without a sports hall. 1) If it’s not broken don’t fix it: The only reason that the scheme has stalled is due to a collapse of the housing market in Ireland and a total meltdown of the Irish banking sector. 2) Any changes to the plan at this stage will allow to the developers to renege/remove firm commitments made to deliver future infrastructure and amenities as set out in the existing plan. 3) Infrastructure and amenities commitments were not put forward by the developer in the first plan passed by the council in 2003 nor did the planning department see fit to include them they were achieved by local groups appealing the decisions to An Board Pleanála. 4) No public pool exists in Lucan the only major urban centre in South Dublin not to have one. Despite many promises by County Managers it was never delivered. At the oral hearing at An Bord Pleanála the ‘Deliver it Right’ campaign successfully achieved the inclusion of a swimming pool in the Adamstown scheme. This is one of the first amenities the developer will ask to be removed under this review because of the costs (building and running). 5) Chartdrige developments opposed and succeeded in preventing a planning application for the development of 20 metre pool at Finnstown House Hotel on the grounds that one would be developed at Adamstown, This could prove a double blow for the residents of Adamstown/Lucan if it’s now removed from the amended plan. 6) Any reduction in density requirements will mean the frequency of public transport service will not be increase, residents will continue to use their cars. (a) Why were these apartments granted permission when there were over 8,000 units yet to be built at Adamstown? (b) What has changed the planners thinking since 2011 putting lower density back on the table? No more land will ever be made. 8) Apartment living and higher densities has been part of city planning psychic in all major urban centres for decades, because planners in Dublin have not implemented Dublin’s footprint with 1.2 million people is equal to that of Los angles with 4 million. 9) Even the most negative economists will admit that the markets will return over the next few years. At present it makes no difference what you are selling nobody can get a mortgage. So why change now? 10) The population of the Greater Dublin area is expected to hit 2.5 million by 2050, we cannot return to urban sprawl of the past 20 years. Sustainable developments such as Adamstown are the future with amenities and transport links all within walking distance. 11) The same people who are now advocating a return to more “family units” (3 beds with front and back gardens) are the same spin doctors who were advising everyone to get on the property ladder back in the early noughties as property prices would continue to rise. 12) In its current form Adamstown can become a sustainable community. 13) Lowering the density of Adamstown will make the town centre unviable. A key part of the strategy behind Adamstown SDZ was to create work for its residents close to their environs. 14) We need to ensure that social housing is distributed evenly through Adamstown and not located in confined areas. To collude I do not favour any change to the Adamstown plan, as I believe it’s a veiled attempt by the developers/Nama to use any such review to remove key and expensive infrastructural and amenities promised over the coming phases. I hope the council in its review will ensure that not a single commitment to deliver infrastructure or amenities is dropped from the existing plan. I would also like to see all commitments surround density which directly links to the delivering of a more frequent public transport service at Adamstown, honoured. This review in my opinion has all the hallmarks of planning for short term gain at the expense of the long term development of Dublin. I was part of the group that appealed the original plan and had key infrastructure and amenities included. I have lived here since May 2009 because I believe the scheme as it was finally adopted was a good one. Please take my comments on board in this review process.